The 'Rocket', designed by Robert Stephenson (1803-1859) and George Stephenson (1781-1848) became famous after winning the Rainhill Trials, a competition staged in 1829 to establish the most efficient locomotive for haulage on the Liverpool & Manchester Railway. 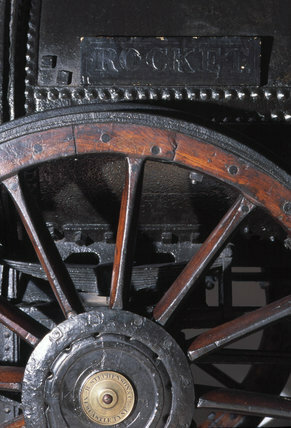 The Rocket ran on the Liverpool and Manchester Railway from 1829 to 1836 and the Midgeholme Colliery Railway in County Durham between 1836 and 1840. It was preserved in 1862, semi-derelict and incomplete. The tender and other items are mising.